return later and do as they wanted. Luckily ur security office had a bolt cutter that was able to take it off. Was hoping to see if anyone has experienced this before or read about it anywhere else. Any insight would be appreciated. My bike is an all city big block that doesn't have any decals Im assuming the person who put the lock knew what kind of bike it was and it wasn't some random prank. I have not heard that trick and am glad you got it removed. Sounds like a plausible theory. You could always leave it there and spend the night waiting with three friends and some baseball bats right around the corner, but that would probably only lead to more trouble. I once had a human piece of excrement put crazy glue in the locks and ignition of my motorcycle, and the only theories my friends and I could come up with was that they wanted it stuck there to steal later, or it was a dumb prank. I also had a motorcycle stolen and later recovered by police. When they found the bike, it had a huge lock and chain around the front wheel. Of course the cops didn't offer me any help, and basically told me to steal it back (and that was only possible thanks to the help of a local guy with an angle-grinder who had noticed the bike randomly parked on his street for 3 months). I'm sure the thief planned on coming back for the bike (luckily it was nearly out of gas when he/she stole it), but they might have looked it up online and realized it wasn't that valuable after all. Never happen to me but have heard of that hustle but can't remember where. You did the right thing to not wait as the stealing of your bike was in progress. The baseball bat thing does sound appealing. If this happens again I would wait around with a few friends and confront whoever does it. ​​​​​​They likely wont try it on your bike again, but they might on another nearby. Glad you were able to resolve the situation. Having the key for the U-Lock seems like it should be good enough proof to any security-minded person that the bike is indeed yours, and I'm glad they were willing to help you out. Otherwise, uber to nearest hardware store and back to buy your own bolt cutter? That would be obnoxious, to have to pay probably $30+ to keep your bike. I wonder if cop cars commonly carry cutters (that's a lot of 'c') of chains and cbolts? Having the key for the U-Lock seems like it should be good enough proof to any security-minded person that the bike is indeed yours, and I'm glad they were willing to help you out. That is why I always put my lock on the bike I am going to steal before I call the police to have the owners lock removed. 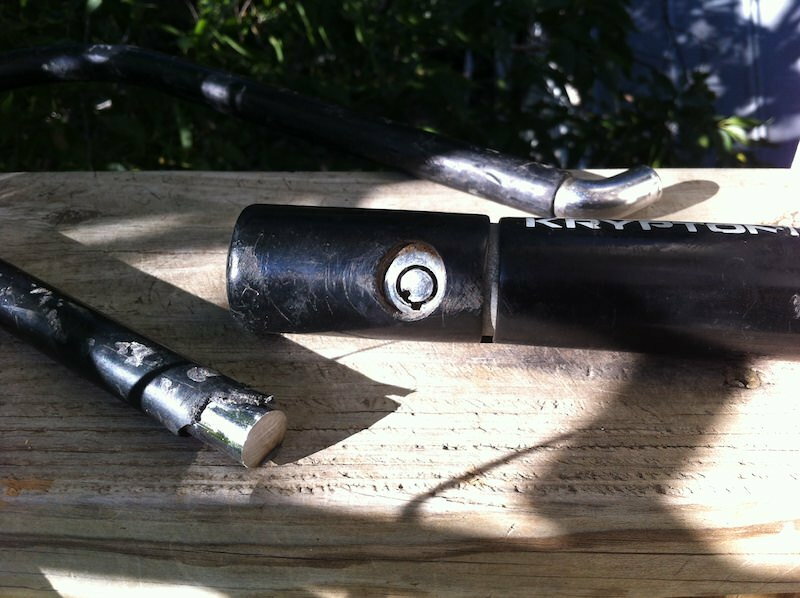 You could also remove the lock with a chain tool and spoke wrench. so far I have been successful..
Dirtbags slapping a lock on target bikes is an old trick. The plan is to come back later for it. Good on you for not falling for it. Wow, I've never hear of that happening. It might be worth asking around in the next couple of weeks to see if it has happened to anybody else. I've never been to Dallas so it's hard for me to say how helpful the police would be in your situation, but that should be dealt with because it's probably not the first or last time that guy has done that. Somebody screwed up my U-lock a few years ago and I had two theories: desperately stupid thief stuck a screwdriver in there and failed, or a semi-clever thief ruined the lock so I would have to leave the bike overnight. Fortunately a fellow staffer happened to have an angle grinder in his truck and had that big Kryptonite off in about a minute. A couple of lessons learned that day . . .
That looks like the Bic pen trick, before they fixed that vulnerability in tube locks. Sorry but that sounds like a New York stereotype solution but man I definitely approve if it is!! Police Officer "Why did you guys have baseball bats at 2am on a dark side street? Were you looking to beat this bike thief?" Answer " We weren't looking for trouble, we were going to the ball diamond and wanted to get there early and then this guy with a padlock key attacked us and we had to defend our lives!!!! Fortunately they used a chain that was easy to bolt cut - and not Gold rated U lock. Glad they are out the cost of chain and lock. Last edited by Crazyd; 06-27-18 at 08:52 PM. It's been a thing around on campus that someone puts a cheap padlock on someone else's bike. The owner of the bike locked it up on the bike rack but had taken up many spaces (like across the old style rack). It was a repeat offender who was purposely and very inconsiderately was blocking the bike rack so others could not use the rack. The padlock trick also came with a note telling him to stop being so inconsiderate. Note: the bike rack offender had been heard saying that he did not want anyone scratching his expensive bike and did not want any bike near his. It took 2 padlocks before he really got the hint. I know the trick, luckily the thieves usually use cheap cable locks. I helped some people with it once because they had parked their bikes next to my front door, and told me what had happened. I looked at them and was absolutely sure I could trust them not be the thieves themselves So I went upstairs to get a wrench, unscrewed the kickstand, twisted it in the cable and with one forceful final twist it snapped. Like I had done that 100 times beforee, then they thanked me but looked at me and wondered If I could be trusted ..... I've never stolen a bike or bought a stolen bike myself but there was a time here a quite a lot of people didn't consider stealing an old bike real theft, and stories go round.That's how I knew.